Commute Orlando has awesome graphics. The picture on the right shows a car passing in the opposing traffic lane. They also have great tips on urban cycling. 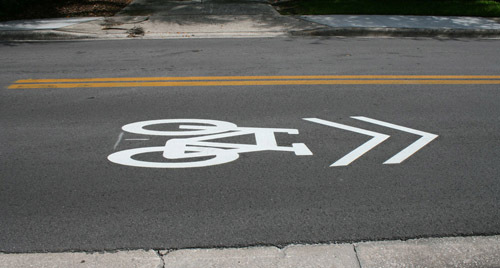 Carbon Trace suggests that arrows promoting bike use of a traffic lane are best when painted in the middle of the lane. It’s better to show that the whole lane is used for multiple kinds of traffic, rather than a dedicated bike lane and a dedicated motor-vehicle lane. If they’re offset, they tend to suggest lane position to both cyclists and drivers. The purpose of sharrows, technically known as Shared Lane Markings, is primarily to indicate a cyclist’s right to the lane. It does not confer this right, it just informs road users of it. Cyclists have the right to the lane on every road and only have to ride to the right and share a lane that is 14 feet or wider AND has unobstructed pavement on the right third AND when this position does not otherwise interfere with a cyclist’s safe operation. They have another cool picture, too. City planners and community activists – think about it! Especially when implementing programs like Complete Streets and Livable Streets. Next Next post: Yes, we’re riding tonight!